An amazing refund for the first month of the new premium original novels! Original novels have now been on Webnovel for several months, with numerous authors creating their own original stories. Most of these authors aren't professional authors. Instead, these authors have a passionate love for their work and a sense of responsibility toward their readers. No matter if it's raining or snowing, or if they're sick with a cold, these authors adamantly persist in updating on a daily basis. After approximately four months of hard effort, some excellent stories have accumulated a significant number of loyal readers. It's time for us to thank these authors for their hard work and motivate them even further to continuously update. The newest chapters of these three novels are now entering Webnovel's premium plan. In addition, an option to gift the author of these five contracted novels is now available in webnovel app. We hope that everyone will continue to support these original novels so that these marvelous stories are able to continue with your assistance. Webnovel will forever support and do its best to further develop original novels. That's why we're now hosting this "You Read, We Pay!" activity. Rules: Up until September 1st, midnight (GMT +8), all readers that have purchased all the premium chapters for any of the following three novels shall receive 100 Spirit Stones in early September! In order to appreciate your support, the authors of these premium original stories will give you mass releases. Everyone, please continue supporting original novels and each author who creates a marvelous world that you enjoy! PS: These gift cards will be sent via Webnovel's messaging system at the beginning of September to all qualifying readers. Please remember to check your inboxes. WEBNOVEL_OFFICIAL Yay more paywalls are being added on qidian, so excited! And I thought Arnott’s rebranding their Shapes product line was bad.. lmfao. WEBNOVEL_OFFICIAL If I catch up to the latest chapter now, will I be gifted the SS at the end of the month? Or do I have to buy every chapter until September 1st in order to get the free SS? wow just wow, because i got first. lol, I will still start my premium next month. kcgarbin How do you start in premium? Im clueless. hurmm....so! if I read any of the original stories release by Qidian....me will be given monehhh? by Qidian? Really? to tell the truth...Gift are not money!! Please...stop lying to people!! 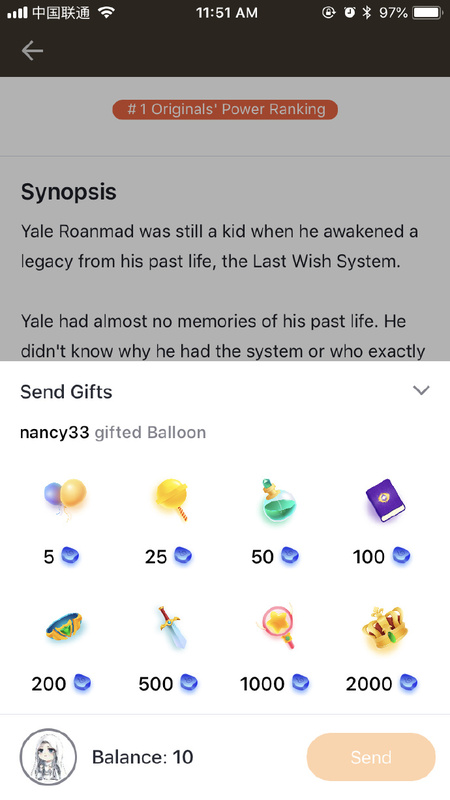 this post should be " You Read, We Gift!" something similar...since for me the word 'Pay' is equal to money!! or gold!! or Silver!! or Diamond!! can you equalized Virtual balloon with Monehhh?? unless you can change it to a real one...geez!! loliD no what the title means is we read the stories and spend stones and they will now pay the authors who are uploading stories for free/fun. So now they are now showing that they will fully support any author that releases great content. Sad as a reader, but happy as a fellow author. Congratulations for the contracted novels! The good part, these novels won't be dropped in the middle. Hopefully. "you pay, you read and we pay you virtual gift"
I'd be surprised if this system works, i expected a twitch system rather than virtual money. This works in China very well but it wont be easy pulling it off in a very diverse user-base. GreyMonkey19 What is a twitch system? I think this type of system work in Tapas. Tapas (Mostly Manga) even locked chapter until you pay. If we purchase every single premium chapter from all 3 novels do we get 3 gift cards? or just 1? It's nice to see original authors get appreciated. Gives people like me hope to continue with my work. Is it worth reading works that you have to hype up using fake reviews, review swapping and deletion of negative reviews to bump up rating worth it? CreamPuffDelights If you are male reader, Consuming Earth is good. The hero had some 'sense'. I don't know about the "one" you talk about. For female reader, I heard PS is great. Started to read Last Wish System. Interesting. pyesone just a bit of a heads up. Book 2 can be total head ache if you pay attention too details... so if you have patience good for you. Maximilian you may have to update the app. Mine just auto updates and even the icon is different!